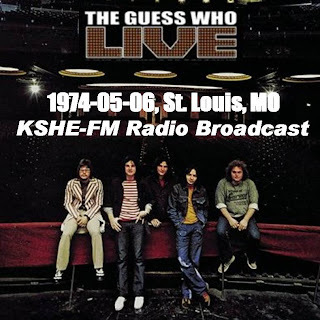 The Guess Who - St Louis USA 1974. The Guess Who are a Canadian rock band from Winnipeg, Manitoba. Initially gaining recognition in Canada, they also found international success from the late 1960s through the mid-1970s with numerous hit singles, including "American Woman", "These Eyes" and "Share the Land". This concert performed at The Ambassador Theatre, in St Louis, MO, on the 6th May 1974 was one of the last show before guitarists Kurt Winter and Donnie McDougall left the group and is considered by a good number of fans as the overall best line up. Broadcast live on FM by radio station KSHE (the source of this recording), the concert is both fascinating and a testimony to the band getting on with the job when the bass amp fails and a probable electrical outage left the band with no option early on but to do a couple of unplanned acoustic numbers "Artificial Flowers" and "Sour Suite" both of which actually add to the gig and are well received by the audience. Background: The elusive and talented man behind a long list of film scores and musical projects, Ben Lovett, is unveiling a new opus that spans the country and includes an all-star carnival of contributing musicians, film directors, kids, choirs, and painters. The Lovett collective are releasing Highway Collection, available March 15th, 2011. Through a nomadic and exploratory lifestyle, Ben Lovett has created an album of compelling variety, captured in motion, each song brilliantly crafted ‘from a different part of another life’, into a diverse philosophy of sound deep enough to sink a ship. On Highway Collection you find a driving pulse and child-like innocence akin to The Shins, layered with zany and dreamy backing vocals a la The Flaming Lips, floating above the rolling drumbeats of a modernized Strawberry Fields-era Beatles, all led by a constantly evolving voice with an eloquent message of mature and heartfelt universality.